"Tsuri Onna", the Kabuki version of the kyôgen "Tsuribari", was written in 1883 by Kawatake Mokuami (lyrics) and Kishizawa Shikisa VI (music). It was revised later on by Takeshiba Shinkichi and staged for the first time in July 1901 at the Tôkyôza, starring Ichikawa Ennosuke I and Nakamura Kangorô XII in the roles of Tarôkaja and the ugly girl. A daimyô and his servant Tarôkaja go on a pilgrimage to the Nishinomiya shrine in order to pray the Ebisu God and get their main wish granted: finding a perfect spouse. After the prayers, they decide to spend the night in the precincts of the shrine, waiting for the answer of the Ebisu God. The daimyô and Tarôkaja have the same premonitory dream, in which the God tells them that a woman will be waiting for them at the Western gate of the shrine in the morning. The 2 men wakes up and rush to the western gate. 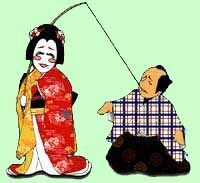 They find a fishing rod near a little pond and decide to use it to fish for their future spouse. The daimyô tries first and catches a veiled woman. He lifts up the veil and discovers a beautiful princess. He immediately asks if he could marry her. The Princess accepts and Tarôkaja, who had the good idea to bring a bottle of sake, decides to celebrate the wedding on the spot. After the libations, it is the turn of Tarôkaja to fish for a bride. He catches another veiled woman and starts to court her. She accepts his advances and Tarôkaja lifts the veil ... finding an amazingly ugly and manly woman, strong like a woodcutter. Tarôkaja tries to run away but the woman vigorously hangs on him. The daimyô kindly laughs at him, telling him to respect the decision of the God. Tarôkaja has no choice but resigning himself. 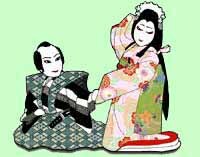 He decides to dance to celebrate the coming wedding, while he ugly woman rushes at the bottle of sake and quickly drinks it, just like a drunkard of the worst kind. It is time to leave the shrine and go back to the mansion. The daimyô and the Princess are the first to depart, followed by the ugly woman, who pulls with the fishing rod the unfortunate Tarôkaja.